For my last night in Vancouver, I moved to another SPG hotel. 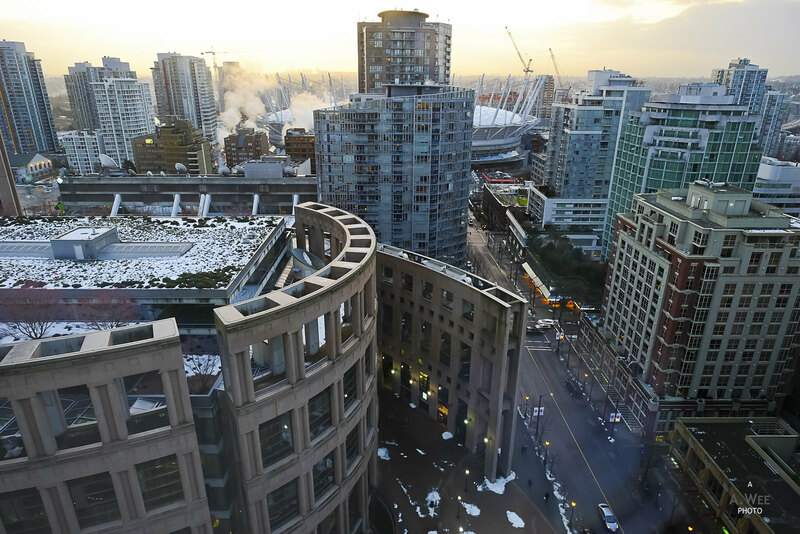 This time it was the Westin Grand located along the Robson Street close to Yaletown and a few blocks from the BC Place stadium. This is a relatively new part of downtown that became busier in the last 10 years or so. The hotel has a side porch visible from Robson Street and has a paid underground garage for cars. 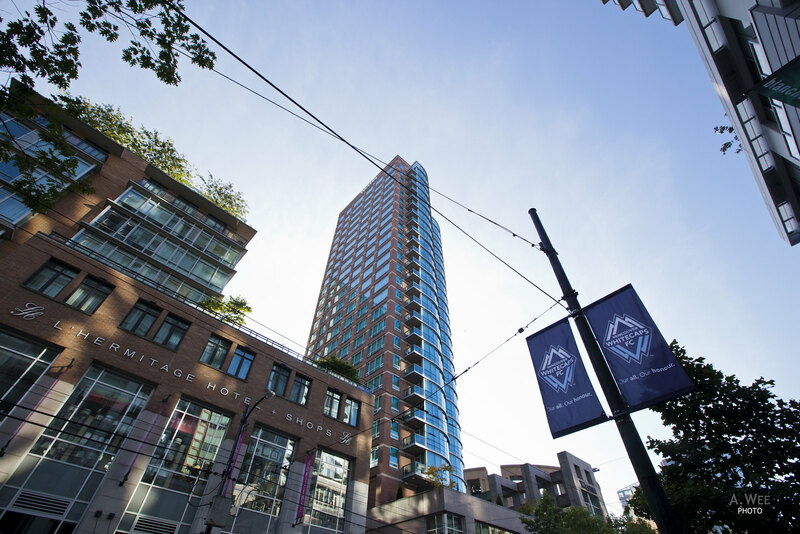 However the hotel is undergoing a major renovation of the lobby and staircase entry from Robson Street. The hotel lobby is normally accessed from the elevators by the side alley, right on the second floor. 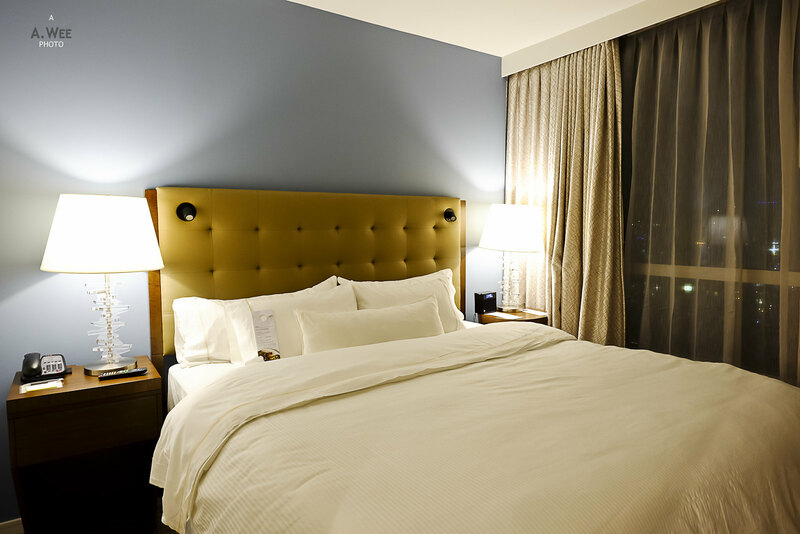 Do note that there are a total of 3 Westin branded properties in greater Vancouver, with Westin Grand and Westin Bayshore located in Downtown while Westin Wall Centre is located in Richmond, closer to the airport. 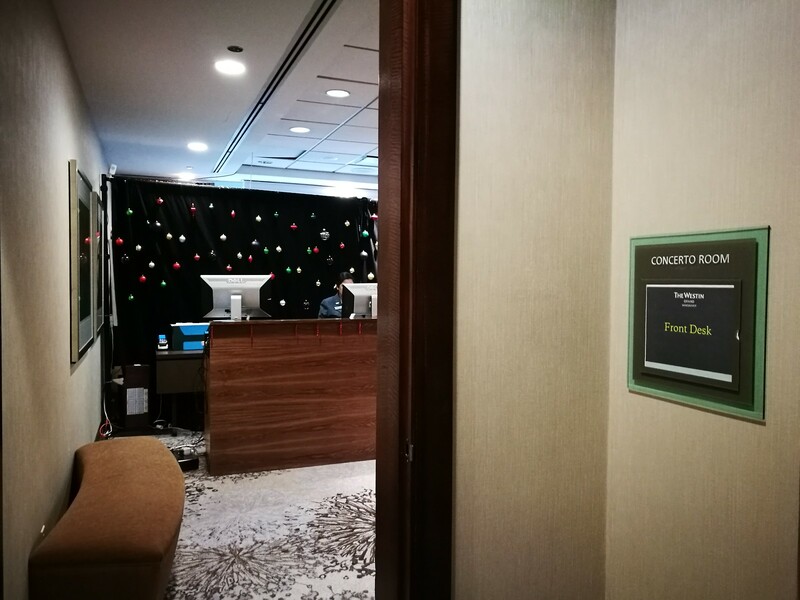 Due to the renovation, check-in was conducted on a makeshift reception using one of their meeting rooms. There was 2 counters and a table setup for drinks which is usual for Westin hotels. Considering I arrived for check in at around 10am, I was surprised they had a suite ready for me. Yes, a real suite since I was upgraded automatically as a SPG Platinum. 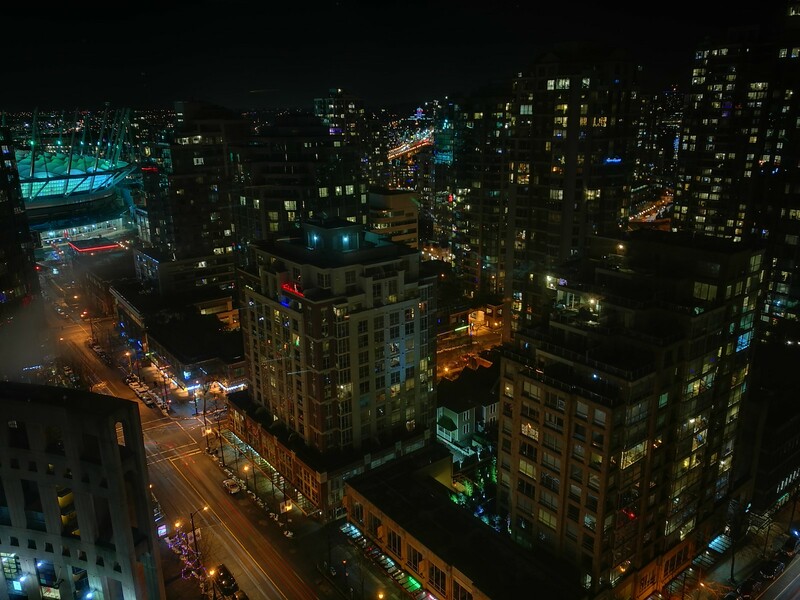 I did request for a suite facing the Robson Street and they were able to accommodate me on that request as well. Unlike many Westins I have been to, this one is fairly compact in layout with only a few rooms per floor, though it makes up by being a relatively tall building. 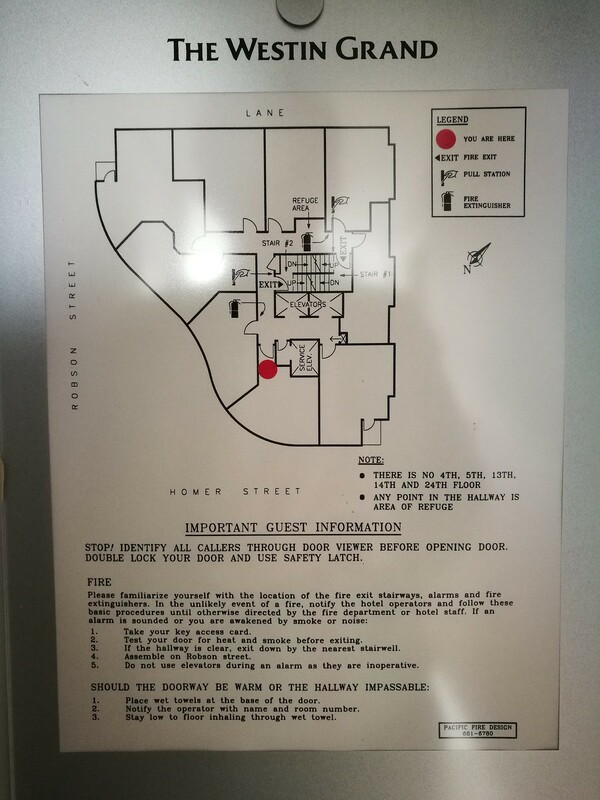 My room was located diagonally across from the 2 elevators and thus easy to find out of the elevator. However I have to say the number of elevators was somewhat inadequate resulting in waits most of the time. There is a long foyer upon entering the suite and by the foyer there is an alcove with a bench for your luggage. Making this space more functional, there was a couple of robe hooks which works for the hoodies and coats guests might need for Vancouver’s winter weather. 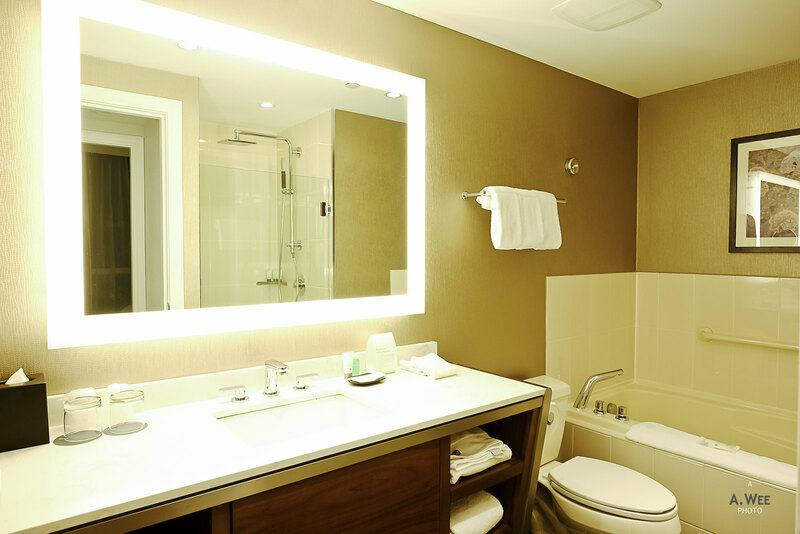 There is also a mirror to see how presentable one might be before leaving the suite. Beside it there is a minibar and the usual Starbucks coffee machine. Being a newly renovated suite, it still had the smell of paint and glue when I entered. Fortunately it was not too strong so I was not too bothered about it. Past the alcove there is a spacious living room fitted with a 2-seater sofa and an armchair. A large pouf with a wooden overlay functions as both an ottoman for the leg rest and a part-time coffee table. Along the wall, there is a flatscreen TV on the work desk along with 2 bottles of water. My stays with SPG have basically allowed me to take bottled waters for granted and it is a very useful amenity that I value highly. Across from the living room, there are 2 separate rooms – one for the bathroom and another for the bedroom. 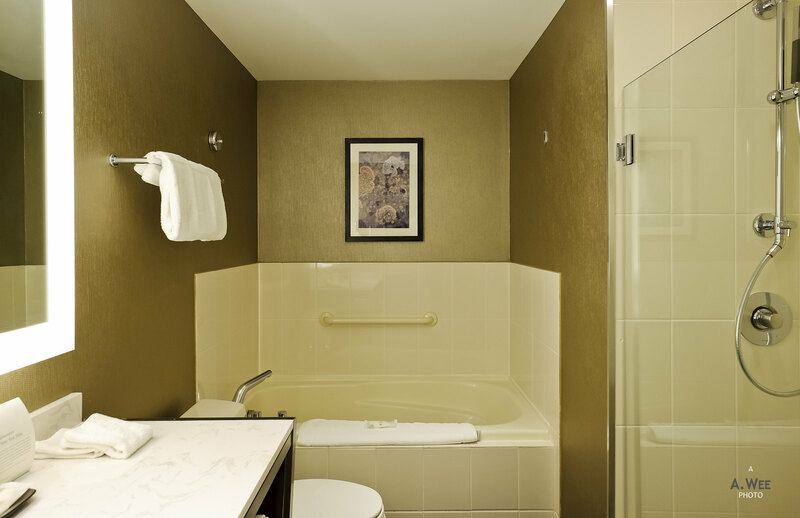 The bathroom is another outstanding feature of the suite. The walk-in shower complete with Westin’s trademark rain-shower head in addition to a separate albeit small bathtub was my favourite feature as I value the walk-in shower more than a bathtub. The bright lighting and space for toiletries made it all the better. Like the Westin in Whistler, this property has the refreshed Heavenly Bath amenities in a tube format rather than the bottle format. This is an improvement as I find amenities in a tube format easier to handle while showering. 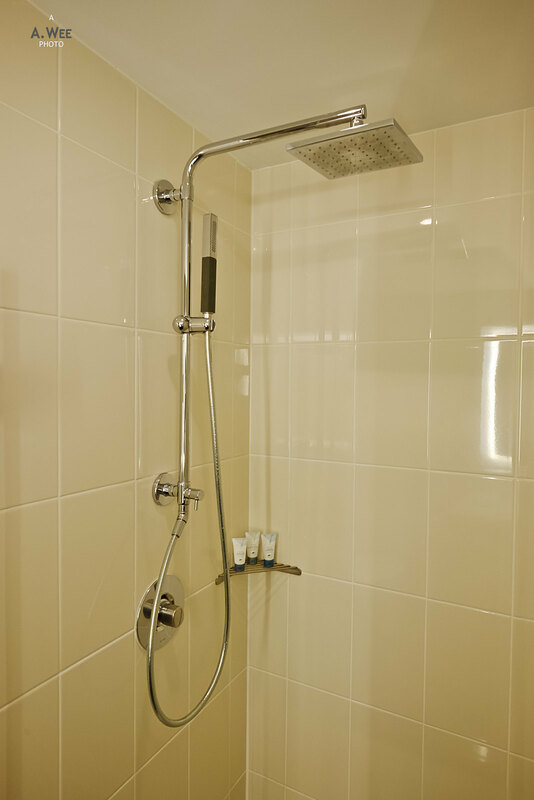 The shower also features the usual rain shower head with good water pressure. Another amenity that made me partial to Westin properties. Across from the bathroom, there is another door leading to the bedroom. The bedroom is quite small but it still has a King-size Heavenly bed inside, and it is comfortable as always. 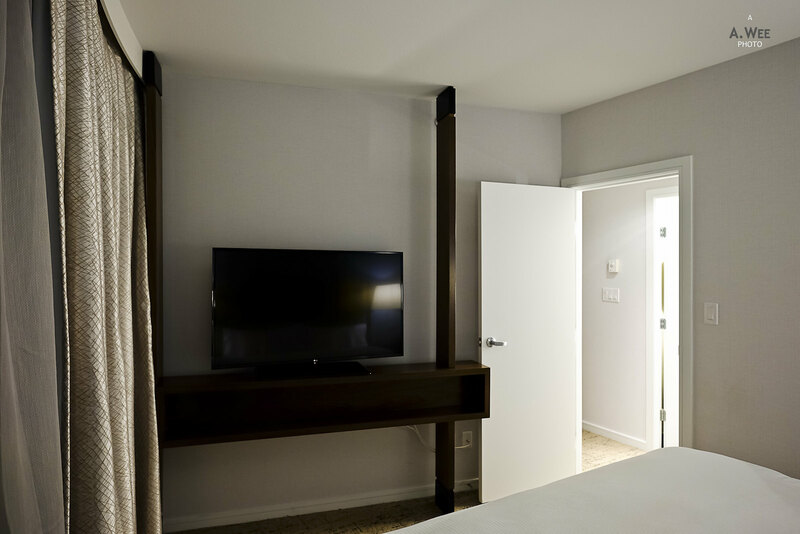 The bedroom is fitted with another flatscreen TV, making this a real suite that really feels like a small sized apartment. The only amenity lacking for a long term stay is a kitchenette, but who needs to cook when there are plenty of eateries around the hotel? With the upgraded suite, I had a nice view of the surrounding area and the wavy pattern meant the bedroom had a view of the Public Library square. The height also meant a good view of False Creek so it was a very nice suite. The hotel has an outdoor hot tub and swimming pool located on the 3rd floor that is a focal point during the summer. The pool has a garden terrace and patio which could be used to hold events and I know there are a couple of summer events so the pool might be closed to hotel guests on these occasion. There is also a fitness centre that is open 24 hours for guests to use. To cap it off, the rates for this property varies between C$120-160++ (~$90-120) in the winter season and can rise up to C$240-280 (~$180-210) in the summer season. 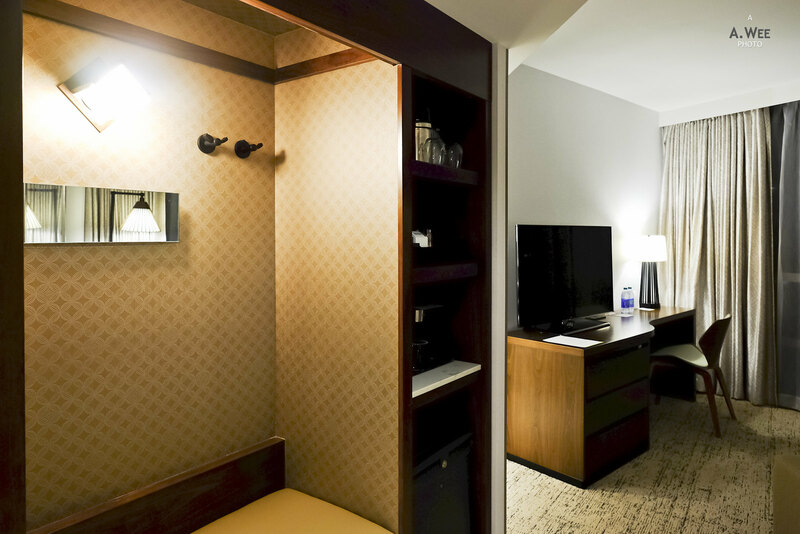 Amongst SPG hotels within downtown Vancouver, it is probably the cheapest and the all-suite concept makes it easy for me to recommend this property for families who need the space. 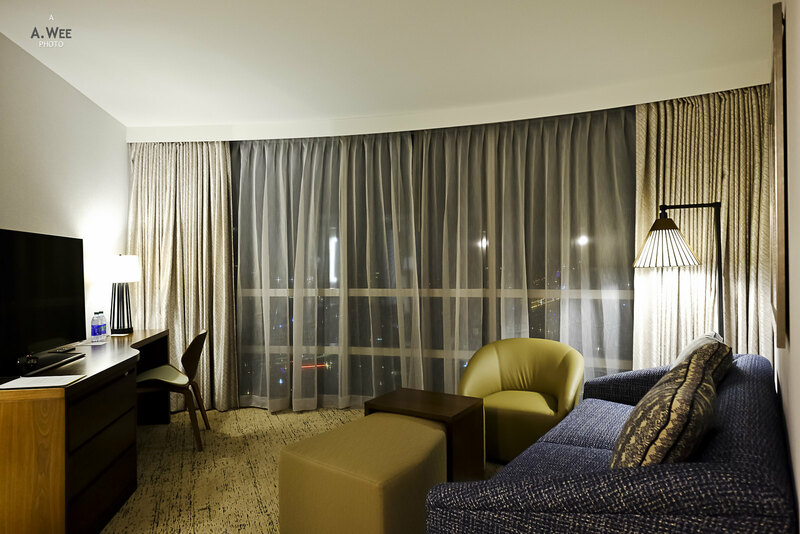 The convenient location within downtown also makes it easy for leisure travellers, though it is a bit further away from the financial and business offices.